What is the EDM process? When Should I Use EDM Processing? EDM is ideal when secondary operations are too labor intensive to justify more traditional machining operations. EDM allows for cutting complex shapes and thin walled configurations with out distortion. EDM can replace many types of contour grinding operations and eliminate secondary operations such as deburring and polishing. The danger of scrapping a complex or expensive part because of tool breakage is eliminated. It is ideal for machining dies, tools and molds. EDM is a no-contact and no-force process well suited for making delicate or fragile parts that cannot take the stress of traditional machining. It is ideal for manufacturing pieces with walls as thin as 0.002 of an inch EDM should also be considered for parts that have cavities with a depth to width ratio greater than 50%. 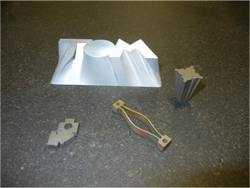 EDM should be considered a low cost tooling option when you need short run stamping and low volume broaching. Our standard wire EDMs can cut parts 10 inches tall with a width and length of 11 ½ by 8 inches. How To Determine When EDM is Appropriate? No force between tool and work piece. Work piece is vaporized not cut. No rotation of tool or work piece. Consider using EDM when parts have high ratios of cavity depth to width, such as slots and ribs. Since the EDM process does not require force, you can use very long electrodes to make extremely intricate ribs. If you have a difficult recessed cut to make Wire EDM is an ideal process. It can be used to make fixtures, collets and jet engine blade slots, mold cooling ribs and reinforcing ribs. Since the electrode does not come in contact with the material, there’s no adhesion of the work piece to the tool. This fact makes wire and ram EDMs ideal for making magnetic reader heads for missiles, artificial joints, turbine blades and car engine prototypes. EDM doesn’t recognize hardness of material, so it’s ideal for cutting materials that have hardness above Rc 38, including hardened steel, Stellite and Tungsten Carbide. 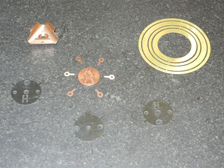 EDMs are used to create complex dies and other tools from extremely hard materials. If you’re making a part or product with a material that tends to leave tough burrs when using traditional machining, EDM can solve that problem. The EDM process leaves no burrs and the vaporized material is flushed away by the dielectric. By eliminating the deburring process, EDM eliminates extra operations and the potential of causing dimensional changes that can occur during the deburring process. 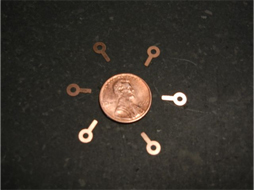 As a result, EDM is often used to make surgical tools and copper electrodes. Eliminating extra steps lowers cost. An additional cost advantage is the unattended nature of EDM. This makes it a cost-effective process allowing unattended operation. The fast turnaround time in EDM makes it ideal for small lots of parts, allowing you to reduce inventory or quicken delivery dates. This contributes to improved cash flow and reduced operating expenses. What is the smallest wire cut hole? The answer is dependent on a number of variables, however a rule of thumb answer is approximately 0.018” diameter. However, with the right conditions it may be smaller. Please contact us when this is a critical consideration. What is the smallest ED bore hole? Again the answer is dependent on a number of variables. The rule of thumb answer is 0.012” diameter. Please contact us to verify viability. What is the range of surface finishes? Our best wire cut finish is 10 micro inches. Finishes this fine are material dependent. What wire sizes do you use? Wire uses between 0.004” diameter and 0.012” diameter wire. Do you reuse the wire? No, the wire breaks down and is not reusable but we do send it to recycling. Does the wire touch the part? No, the machining is done by electrical discharge “the spark”. When the wire touches the part it produces a short circuit and cutting stops.